Most people speak with relatively thick vocal cords. It gives a darker and lower sound. However, when we sing we need to use thinner vocal cords. Thin vocal cords are better capable of managing the larger range of tones when we sing. Especially the high notes need to be sung with thin vocal folds. Otherwise you will damage your voice or will not be able to sing the high notes at all! Women use thinner vocal cords than men, though. 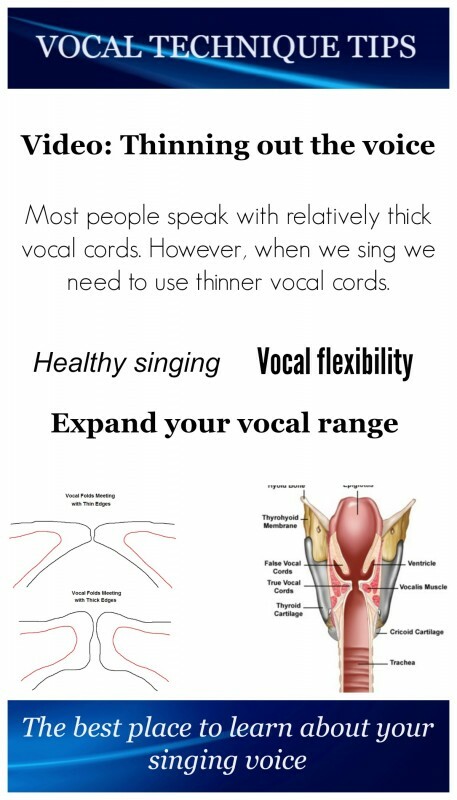 A good way of training the thin vocal cords is gently humming the “NG”-sound and start on a relatively high tone and then gradually lower the voice and maintain the thin vocal folds. Another way to thin out your vocal cords is by adding some ‘vocal fry’ to the tone first. In the video vocal coach Shelbey Rollins explains how to do it. Keep in mind that in classical singing you sing mainly on thin vocal cords because you do not want to hear the voice break. However, there are exeptions! As mentioned before, men more often use thicker vocal folds than women while singing classical repertoire! Another great way to train your thin vocal cords is humming.